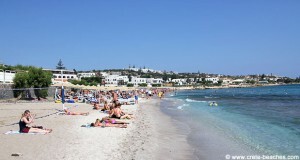 Stalis is situated on the north coast of Crete, between the holiday resorts of Hersonissos and Malia. The airport in Heraklion is the one closest to the town and you can reach it in 30 minutes by car. Stalis has several nice and child-friendly sand beaches which are almost connected. 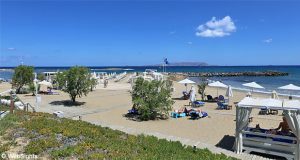 In the western part of the town, next to the hotel Sentido Blue Sea Beach, you’ll find the largest section of the beach, see the two pictures at the top. 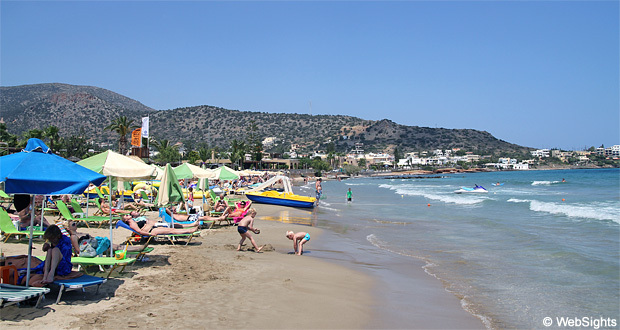 The second largest beach section is situated in the eastern part of town, next to the five-star Aktia Lounge Hotel & Spa, see the two pictures at the bottom. Both beaches have bright and fine-grained sand, and the water is relatively shallow. When the wind comes from the north, there will be waves at the beaches. It is possible to rent sun lounges and sunshades and there is also access to showers and toilets. Some beach sections even have WiFi. The beaches have lovely soft sand and relatively shallow water. Some days, the waves may be too big for small children. The beach in the western part of Stalis offers different water sports activities, including jet skis, banana boat, rings and water bikes. 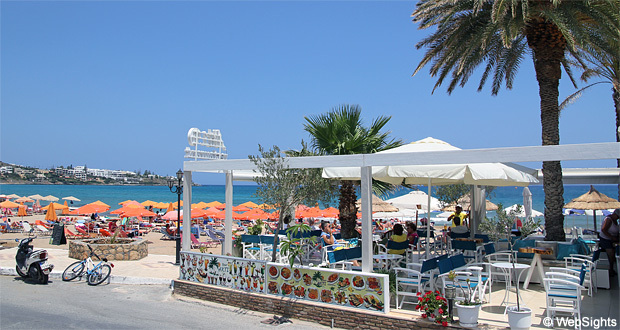 There are many restaurants, cafés and bars behind the beaches in Stalis. Some of them also have service at the sun lounges. 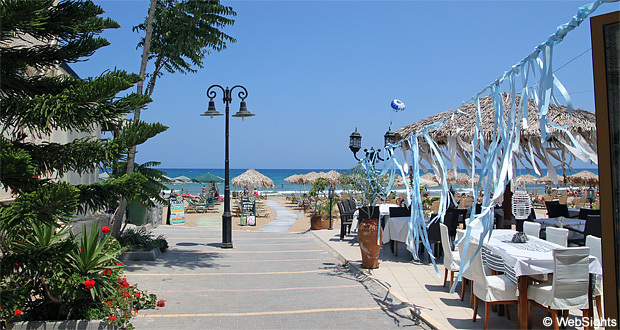 Stalis is a busy holiday resort with many restaurants, bars and shops. 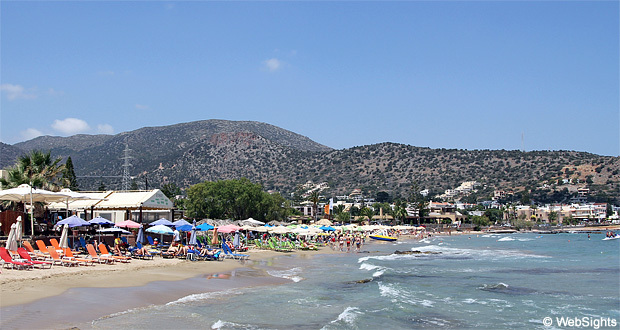 The town has grown into one with the neighbouring towns, Hersonissos and Malia, and it is practically impossible to see where one town ends and the other begins. At one point, however, Stalis differs from the two other towns: its night life. It is far more peaceful in Stalis, and in combination with the child-friendly beaches, this makes it more popular among families. 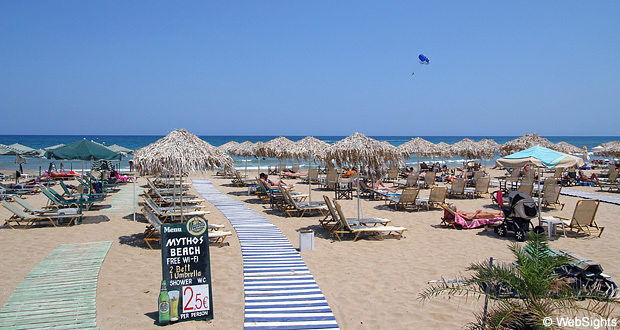 If you need a day away from the beach, the water park Star Beach is only 4 km away in the same direction as Hersonissos. The greatest attraction in Crete, the Minoan Palace in Knossos, is 35 km away in the same direction as Heraklion. There are many options to rent a car in Stalis for a great adventure like that. Hersonissos is located to the west and Malia to the east. The capital Heraklion is located further to the west.